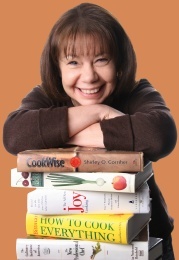 The theme for the cooking class at Grace-Marie’s Kitchen last Saturday was Concert in the Park Picnic, featuring dishes that could be make ahead of time and eaten at picnic temperature. The menu included this Chilled Leek and Zucchini Soup, Tuscan Picnic Chicken Wings, Mini-Red Bell Pepper & Pesto Bites, and Limoncello Squares. I hope your mouth is watering, because each of these dishes was fantastic. Better even. I am writing about the Leek and Zucchini Soup first, because I want to show you an absolutely brilliant technique for prepping the leeks that Grace-Marie showed us. I have never seen this technique in any cookbook, class or cooking show and it is so logical I can’t figure out why I haven’t seen it demonstrated someplace before. Some of the dark green leaves are cut off the end and discarded. If you look at that end, you will see the light yellow and green core of the new leaves inside. So the tough, dark green leaves are pared away, with knife strokes away from you, until only the light edible interior parts remain. Genius! Next the pancetta was diced and sautéed. I love these salty crispy little bits. The pan was sitting on the stove and I have to admit a few were surreptitiously tested for poison. They were ok, thank goodness. The diced leeks, potatoes and zucchini were sautéed in the drippings from the pancetta, adding its salty porky-ness to the soup’s flavor. This smelled so good while it was cooking, especially since there was a bunch of garlic in the mix. Chicken stock was added and the pot was left to simmer for about 20 minutes until the potatoes began to fall apart. Cream and flat leaf parsley were added and everything was pureed in a blender. It was a beautiful creamy soup bejeweled with little flecks of parsley. And finally garnished with brilliant green flat leafed parsley and crispy knobs of pancetta. Perfect for a picnic. Take it in a thermos and serve in plastic wine glasses. Very fun. 1. 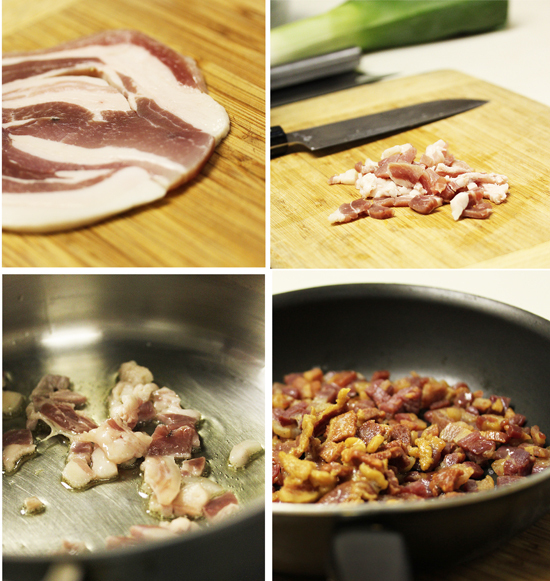 Cook the pancetta and oil in a soup pot over medium heat until it is slightly browned (2 minutes). Remove from pot with slotted spoon and reserve on paper toweling for garnish. Do not clean the pot. Store cooked pancetta in an airtight container, refrigerate and reheat, or serve room temperature when garnishing. 2. 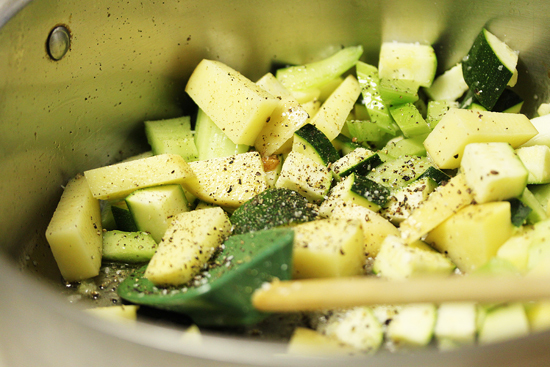 To the same pot add the zucchini, potatoes, leeks, celery, garlic, salt and pepper. Cook, stirring, just until the vegetables become translucent (3 minutes). 3. Add stock and bring to a boil, reduce to simmer and cook until the potatoes begin to fall apart (20 minutes). 4. Add the cream and parsley to soup. In batches, puree soup in a blender (or use immersion blender). Transfer to a container, cover and refrigerate until well chilled. 1. 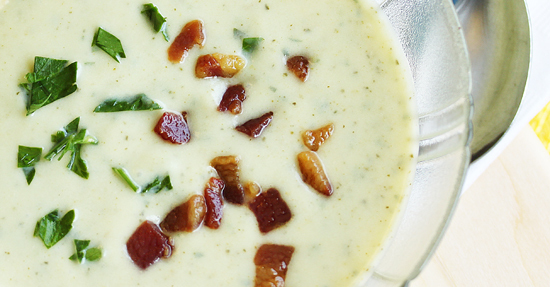 Stir chilled soup well, ladle into large wine goblets, cups or bowls, and garnish with pancetta and parsley. 1. Soup is great served warm. 2. For a picnic… store chilled soup (or warm) in a thermos. Bring along garnish and serve in plastic wine goblets. 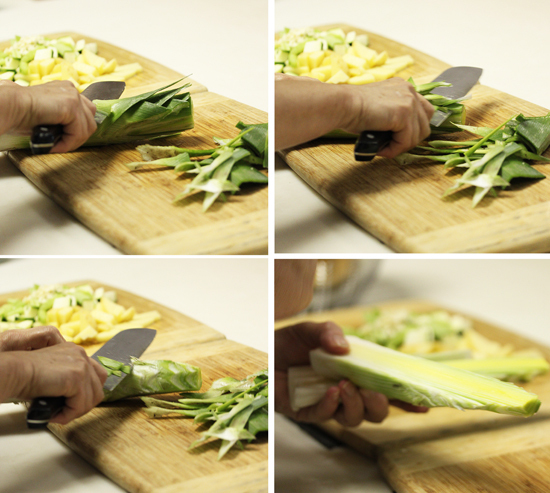 I have never seen that tip for cutting leeks before either and it is simply brilliant!!! 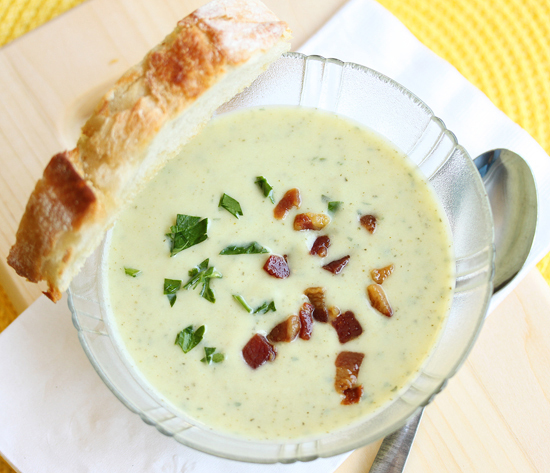 I can’t wait to try it the next time I have to cut up a leek – which will be very soon since I plan on making this soup – it absolutely sounds fabulous!! That looks delicious and your pictures are fabulous! What a delightful recipe…looks beautiful!